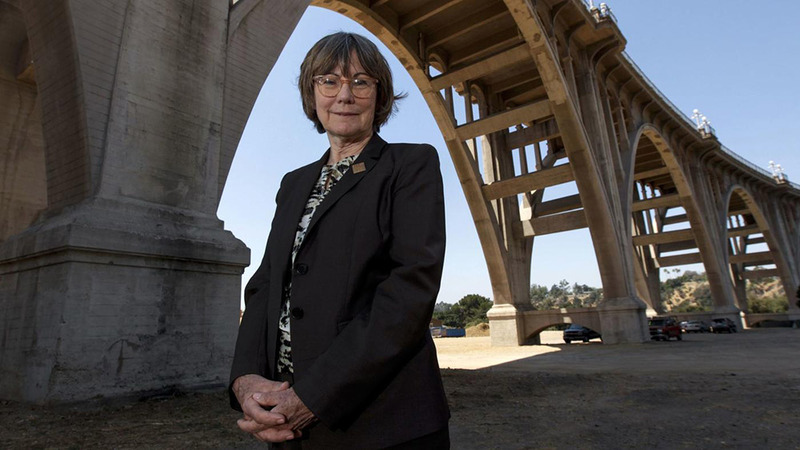 People keep leaping to their deaths from iconic Pasadena bridge. How do we stop them? As you stand on the majestic Colorado Street bridge in Pasadena, high above the Arroyo Seco, it’s hard to imagine the depth of despair that would drive someone to jump. “There is hope,” says a sign on the east side of the Beaux Arts bridge. The sign includes a crisis hotline number and an appeal. But there’s a long history of jumpers since the 1930s, with dozens of deaths during the Great Depression. And a recent surge has city officials scrambling to put up temporary barriers while deciding on permanent solutions. The latest records show six deaths in four months. They hailed from different neighborhoods and had different stories, but the endings were the same. On Tuesday, work crews installed poles that will later have mesh stretched across them to block access to 20 pedestrian alcoves on the bridge, making it harder to jump the fence. At 6 p.m. Wednesday, a City Council committee will review a staff report on possible long-term fixes, along with details on what other cities – including San Francisco – have done to thwart suicides from bridges. The proposals include full-time bridge patrols, higher fencing and netting draped under the bridge. “We’re taking this very seriously,” Pasadena city spokesman William Boyer said. Police have gone to the bridge on 21 “mental health” calls this year, including the six suicides, three active attempts and a dozen more that could have become attempts if not for intervention. Not necessarily, given research on that subject. Considering the bridge’s history, it’s long past time to restrict jumping access and prevent copycat suicides, sparing families the enduring grief that accompanies such a loss. It’s also worth noting that a small Habitat for Humanity housing project is nearing completion under the bridge, with more park space being added to what’s already a public recreation area along the arroyo. Because of the danger that poses on the ground, the city needs to get moving. Steve Bridal, a contractor working on the housing development under the bridge, said he heard the sound of a jumper hitting the ground. “It’s somebody you don’t know, but the act itself is a savage blow to the mind,” he said.